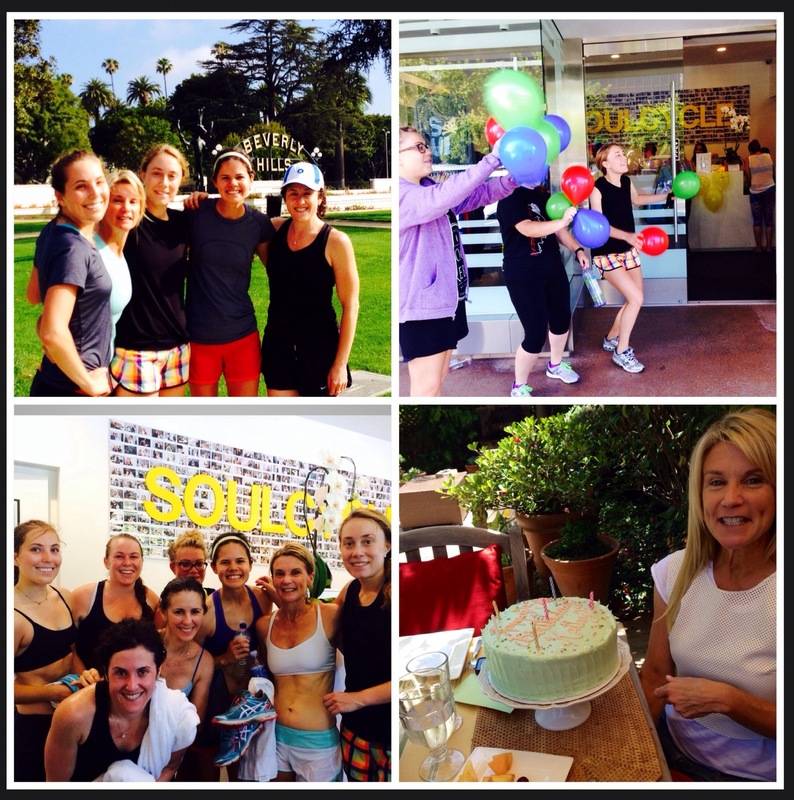 Today we celebrated Lululemon Run Club leader Kathy Adwar’s birthday. Kathy has a huge heart and inspires us all to be better runners. Kathy lives a life of balance, always putting family and friends first. I’ve never met someone so welcoming and kind-hearted. It’s no surprise our run club quadrupled in size when she took over. For her birthday we asked her to be ready at 8 AM, dressed to workout with a change of clothes. We planned a full day of surprises, starting with a run in Beverly Hills. We had a relaxing 45 minute run. No watch, no route. We just explored. We then took her to the Super Soul Cycle class in Brentwood with her favorite instructor Angela Davis, former member of the USA Track and Field team. The class is SO much fun! It’s a sweaty dance party on a bike. I almost fell over at one point while trying to ride and dance to “Lamborghini Mercy.” After our two workouts we had a beautiful outdoor lunch and indulged in Susie’s Cakes. The celebration cake is a fancy version of funfetti. SO GOOD! Kathy hails from Long Island and started running in her twenties. She’d run early in the morning, and was back in time to wake her kids up for school. She never wanted running to interfere with her role as a mom. She was a local champion, racing on weekends. She consistently placed in 10Ks, halfs and fulls. Kathy never travelled for races because spending time with her kids the rest of the weekend was far more important. Kathy has the perfect running philosophy. Just run. Don’t over think it. Who cares if you don’t PR. Just RUN. She has helped me relax and worry less about time. She always tells me my Garmin is slowing me down, limiting what I am physically capable of. I’ve been doing a better job of not looking at my Garmin while I run, and I’d eventually love to race watch free. It’s still my security blanket (mostly because I fear starting too fast like I did in Santa Clarita). I’m lucky to spend my Sunday mornings with Kathy and the Lululemon Run Club. I get my dose of Kathy wisdom and inspiration before starting the work week. I’ve had many happy Kathy moments over the past year and a half, but my favorite was at the LA Marathon when she met me at mile 16. She ran me down Rodeo Drive. While we were running she turned to me, looked at me and sincerely said, “Cristina, you KNOW you’re a good runner.” Her words carried me through the final ten, and her phrase has become my running mantra. I repeat it to myself every time I race. We had so much fun celebrating Kathy’s birthday. We’re so lucky to have her as a mentor and friend! This entry was posted in Sweet Foods, Training. Bookmark the permalink.